It is getting close to sunset. Israa Nouh is arriving to an independent cultural centre on the third floor of an old Heliopolis apartment building. She is already talking to an upbeat young girl in her 20s about the class. The girl is very excited and looking forward to her third class of Level 1 in the belly dancing methodology that Nouh has introduced over the last year. “This girl is still doing Level 1. She is very keen. She has been away from Egypt all her childhood and has missed out on picking up belly dancing as a little girl in the way most Egyptian girls would do. She is doing very well, however,” Nouh said. “I guess one reason she is doing well, apart from her keen interest to learn, is that she was brought up to express herself freely and comfortably; she does not have issues saying what she wants or asking what she wants. Her soul is liberated and so is her body. This is one essential prerequisite to taking up belly dancing for those who have not done so in their younger years,” Nouh added. Herself in her early 30s, Nouh said that she is “the norm” of Egyptian women. “I was little, maybe five or six when I first tried to belly dance. I was watching an old black and white film and l looked with adoration at Tahiya Karioka swaying her body ever so graciously and so softly. I wanted to do like she did, so I tried,” Nouh said. At the time, Nouh’s mother, an engineer who brought up four other children, who mostly studied art, would not “at all” be offended by her daughter’s growing passion to take control of her body and bring it to dance and music. “I know that some mothers act aggressively when they see their daughters trying to dance. They think there is something unbecoming about a girl who wants to dance. Not my mother, however. My mother loves music, poetry and art. For her, my very early interest in belly dancing was a clear sign that like her, and like my dad, who is also very much into music, I enjoyed music, and dancing to it was how I expressed my pleasure with music,” Nouh said. Dressed in a white long-sleeve blouse and a loose pair of coloured trousers, Nouh has her hair parted in the middle and amassed in a messy pony tail. She is not wearing any make up and has no excessive jewellery. “This is my usual look. I don’t go around wearing excessive make up or any particularly flashy look. I guess this is one reason why people have been trusting their daughters and men have been trusting their wives to come to my belly dancing class. They look at me and they see just another ordinary girl – who also happened to be a medical doctor – and they think that it is alright,” she said. Nouh started her belly dancing classes almost a year ago. She had already received her degree from the School of Medicine at Ain Shams University and had pursued postgraduate studies to work in hospital management. She had a job in a medical equipment company and was doing well. Then, one day, Nouh decided that this was not what she really enjoyed. “So, I said, I have been praised by friends and family for the quality of my belly dancing. Every time I had a gathering at my house and we started to belly dance, some of them would ask me to teach them how to do one move or the other, and I always did and it always went well. So I said, why not take it to a larger scale?” Nouh remembered. She was “only slightly apprehensive” about how this would be received – first from her family who might not be too impressed with the idea of their daughter switching careers from that of a physician to a belly dancing trainer. She was also apprehensive “a lot more” about how people would react to the new “business” and how she would go about pursuing it. Nouh managed to get a tentative stay on family concerns on the basis that she is was only working with girls and that she would be conducting her classes either in a gym or a cultural centre. “No private or group lessons at someone’s place; this is out of the question,” she said. She then started an event on Facebook. “In the beginning I was not thinking of doing a full programme. I said I would go one event by one, and then we will see,” Nouh recalled. She set up a Facebook page under the name EnassErayaa (meaning the relaxed and fun-loving people, in Arabic). “For me this is what belly dancing is about at the end of the day: having fun and unwinding. When we dance it is not always because we are celebrating; it is sometimes because we are in pain and we want to let it out, or because we are not feeling well or good and we want to regain our self-esteem,” Nouh said. The first event of EnassErayaa was hosted by a gym in Nasr City and was attended by seven girls, all in their early twenties. Nouh rented the training space and factored in the rent to the fees each girl had bring to attend the event. “It went very well. I had a theme for it: Karioka versus Sofinar. In other words, classic belly dancing versus modern-day belly dancing,” Nouh said. One reason she opted for this theme as a starting point was her own fascination with Karioka – a belly dancing diva from the 1940s and 1950s — and her awareness of the popular, more upbeat dancing style of Sofinar, a modern and well-liked belly dancer. According to Nouh, when women watch TV it is more often than not Karioka and Samiya Gamal, another diva of the 1940s and 1950s, that capture their imagination with their incredible grace and soft command of movement. However, if not Dina, today’s uncontested diva, then Sofinar or Alla Kushnir or Gawahar present a more upbeat choreography. “We are caught in the middle in the love of both: both styles are belly dancing, but one is more dependent on a very high sensibility to music, with incredible hand movements and waist flexibility. Another is more about the management of the muscles in the chest and hips,” Nouh explained. “And girls and women today want to have both, especially that the music currently being produced is more aligned with a modern dance style, though old classics remain full of sentiment, too,” she added. In her classes, which Nouh started after five successful events, Nouh plays both and old and new music to teach her students the arts of movement, often mixing the two to prompt the class to comfortably switch styles. “I am not teaching choreography. I don’t teach women to dance in any particular way. I just help them to acquire the basics for the movements, or even to master the movements, and then it is their bodies that decide the flow of the movement, because it is my belief that we never dance the same movements to the same music,” Nouh said. “A woman who can say no to things that she does not like, and who is at the same time able to pursue what she wants, and vocalise it, is a woman who can dance. She does not have to have perfect body measurements, or great style. She dances the way she wants to dance. She is not afraid to make mistakes and does not care to compare her body or her dance to another woman’s dance or body,” Nouh said. “Some women came in with a clear issue of confidence, maybe because they are somewhat overweight, or because they suffer from injuries. But with time, they came around to liberating themselves from the weight of conscious concern with the things they dislike about themselves, and they allowed their souls to take over. They would embrace belly dancing costumes offered for the class, which they previously declined, and they wear make up and start to shine from within,” she said. This is where Nouh started to see a connection to her years of studying medicine. “It is more beneficial to help a woman to dance than to prescribe an anti-depressant. If it is about stimulating the hormones of happiness in the brain, then belly dancing does it much better than any medicine and with no side effects whatsoever,” she said. 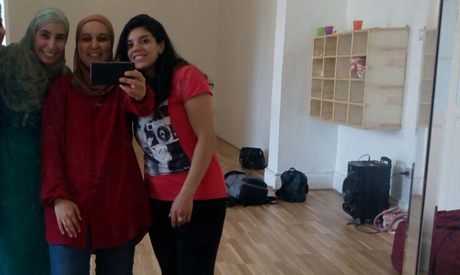 Now, five days a week with five different groups who are doing Level 1 and Level 2 of the course she is offering, Nouh is exercising “psychiatry my way” with classes in Heliopolis and Downtown Cairo. Level 1 is about the basics of belly dancing. “We work together on the concept of isolation; the independent command of, say, the waist away from the chest, and the basics of all the key movements, and facial expressions, because those are part and parcel of the belly dancing experience,” Nouh said. Level 2 is about the coordination of movement. This is about brain and body coordination and about mastering the execution of two movements at the same time. Today, those who attend Nouh’s classes are mostly women in their 20s and 30s, from the heart of the middle class. “But I also have women in their 40s and 50s and some come with their own daughters,” she said. “Some are veiled and some are not and some have an easier-going lifestyle than others. But they all share this wish to dance and to be free, even just for two hours a week, the duration of the class,” she added. Nouh has great expectations for her classes and also has plans to “diversify and customise” the classes in the future. Meanwhile, Nouh is planning to pursue graduate studies in psychiatry. “I do want to practice, but I want to do it in a way that is untraditional. I want to be helping people to depend on their inner strength to relive the pain that causes the traumas. Ultimately, there are cases where prescription medicine is inevitable, but I really think that these cases could be reduced if we help people to better express themselves. That would not just cure pain, but in fact actually prohibit pain,” Nouh said.